Last night (on “Force Friday,” no less) we saw Rian Johnson’s new Star Wars movie, “Episode VIII: The Last Jedi.” Had our 5 pm tickets for the big, Dolby Atmos (mercifully non-3D) theater at our favorite new cinema. Normally I’d post my usual big, fat, spoiler-laden review for it right away in this blog (hey…at least I try to warn my readers, right?) but since so much of this movie is predicated on surprise twists with the characters & plot, I’ll try to do a relatively spoiler-free impressionistic review first instead of a more detail-heavy review (which I may or may not do later on; maybe after I see it on blu-ray). I’ve read many comparisons of “The Last Jedi” to “The Empire Strikes Back” in early press/fan reviews. 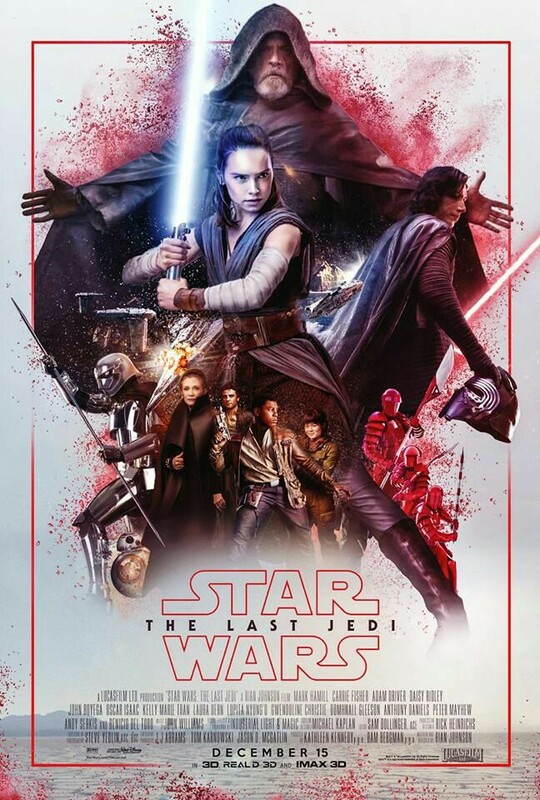 Personally the film reminded me far more of “The Return of the Jedi”; a solid adventure movie with moments of great depth, but with some hobbling flaws that prevent it from entering the higher echelon of sequels, such as the SW universe’s own “The Empire Strikes Back” (still a gold standard for the saga, as well as one of the finest movies, let alone sequels, ever made). To those who loved both “Return of…” and the “The Last Jedi”? I’m not trying to tear down anyone else’s good time here. I’m just trying to suss out my own reasons (and mine alone) for why I am feeling so conflicted about this otherwise enjoyable movie. 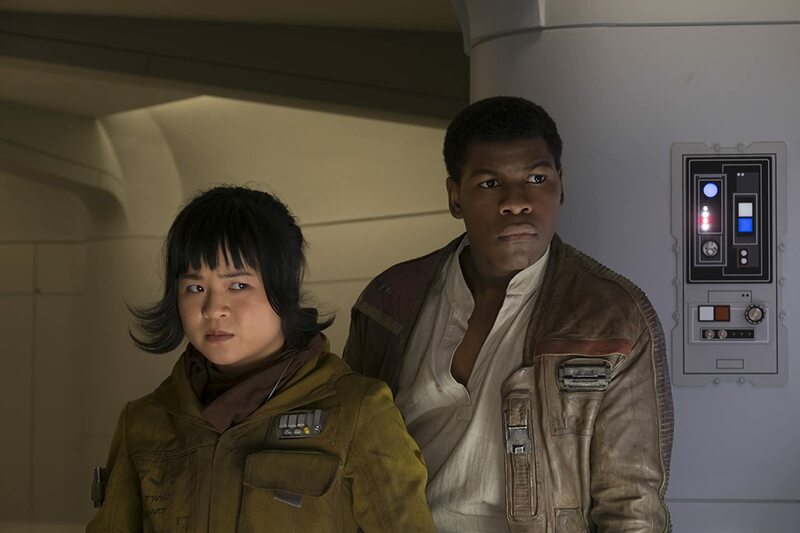 * New character Rose (Kelly Marie Tran). Earthy and lovable. She’s a little like “Firefly”’s Kaylee but with a bit of Star Wars fangirl mixed in. And she’s terrific. More of her in the next one, please. * Stronger female characters in general. Always a good thing when a movie reflects that often cinematically underused 50-plus percent of the human race demographic. Admiral Holso (Laura Dern) may be a divisive character, and she makes a few really dumb mistakes (particularly regarding ‘need-to-know’ information with her subordinates) but she gets one hell of a scene later on that kind of makes up for some of her earlier shortcomings as a leader. * Truly spectacular space battles. Hardly a surprise in a chapter of a franchise known as “Star Wars.” But there is ONE scene in particular, between a massive Imperial ship and a single rebel cruiser, that does something I’ve long wondered about within the physics of the SW universe. It is a show-stopping (and nearly heart-stopping) moment that does NOT disappoint…you’ll know it when you see it. * A very unexpected, but always welcome cameo. Liked it, I did. * Long anticipated character meetings/confrontations. They are strong (and would’ve been stronger, if they were more sparingly used). One such confrontation in particular reminded me of the Luke/Vader/Palpatine scenes of “The Return of the Jedi” (arguably the best moments of that movie as well). * Rey (Daisy Ridley). Daisy Ridley is a terrific, charismatic young actress, and the character of Rey is still one of the strongest things about this new trilogy. If anything, I would’ve rather they shaved off a few more minutes off of the film’s other subplots and redirected that running time towards her character’s further advancement. * Kylo Ren (Adam Driver). Slightly defanged and humbled at first, but comes back much stronger later on. Driver’s Kylo Ren is everything that Hayden Christensen’s Anakin Skywalker wasn’t. * Luke Skywalker (Mark Hamill). While I wished that the character wasn’t so deliberately curmudgeonly at first, I appreciated (after-the-fact) that his return smartly defied fan expectations. Though I do wish that his scenes with Rey were tighter and more focused. * The length. This is a near-fatal flaw with the movie. I’m not against lengthier sci-fi epics; “2001: A Space Odyssey” (1968) and “Solaris” (1972) are two of my all-time favorites. In fact, my wife and I saw the similar length “Blade Runner 2049” twice in one month this year. But it’s when a movie feels long that I begin to notice. Running time is something I’m usually oblivious to when I’m fully engaged. But in this case, there were times when the movie just felt like it was stalling. Despite its frenetic action, there were many sequences, moments and bits which felt very unnecessary, and those moments served to undermine more critical scenes. * The Editing. As my wife commented on the way home, “This movie really needs a fan edit.” So true. With its overstuffed bag of events, the film often undermines its own drama by not allowing certain moments to really breathe. As a result, some of the most anticipated character moments and confrontations are dulled either by unexpected cutaways or (conversely) through lingering too long at times. The editing of the movie feels somewhat stop-start, and as a result, its focus often becomes unclear. There is an entire sequence involving a pair of characters going off together in the middle act that could’ve been effectively deleted and the film would not have suffered for it. Losing it could’ve easily shaved off a half hour, and the film would’ve been arguably better (certainly tighter) for it. And the scenes involving Luke and Rey don’t have the same kind of forward progression as similar scenes between Luke and Yoda in “The Empire Strikes Back.” Every time they cut back to Dagobah in that film Luke progressed noticeably from the previous scene. This doesn’t happen in “The Last Jedi.” This part of the movie was so heavily hyped in pre-release that guess I just expected more from it. Many other important beats in the story don’t get nearly enough time to be savored, while others seem to navel-gaze and meander. The very definition of an editing problem. * Overstuffed and scattered story. Why have one climax when four or five will do? The entire movie feels greatly overstuffed; as if writer/director Rian Johnson (whose previous “Looper” was another movie I enjoyed, but had serious issues with) was trying to fit three movies’ worth of story into one chapter (and this is ONLY supposed to be a chapter…). As a result? Some of the climactic character confrontations and battles lose some of their impact precisely because they’re no longer climactic; they’re in competition with other equally epic moments throughout the movie. There’s just too many things thrown in at once, and few-to-none of them are given enough time (even in a lengthy film such as this) for an audience to properly digest them. Despite the overly long running time, this plot-heavy movie feels frenetic and and unfocused; and that scattershot pacing subverts some of the power from some of the film’s more anticipated moments. In the last half hour of the film, I kept thinking, “This would be a great place to stop and leave us hanging.” But it doesn’t. I applaud the ambition of Rian Johnson, but in this case? A little less could’ve been a lot more. * New character “DJ” (Benicio Del Toro). The character of DJ seems calculated to evoke the kind of moral ambiguity last seen in Lando Calrissian in “Empire” (or Han Solo, early in “New Hope”), but it doesn’t really succeed. In fact, the character could’ve been deleted from the film and it wouldn’t have affected the end results that much (if at all). A waste of an otherwise fine actor (see: “The Usual Suspects” or 2010’s “The Wolfman”). * Princess Leia (Carrie Fisher). This was (tragically and unexpectedly) the actress and her beloved character’s swan song, but she still doesn’t get enough screen time for my satisfaction. * Chewbacca is little more than a cameo, as is R2-D2. Chewbacca was such an important part of “The Force Awakens.” In “The Last Jedi” he’s little more than a nightwatchman who can fly. And R2 is now officially an animated prop. Both were such vital parts of the Star Wars universe, and they now feel a bit like the toys on the shelf that no one plays with anymore. * Porgs. They’re the Ewoks of this movie, except that they’re utterly pointless. Crassly calculated to to move Disney products off of retailer shelves, and little more. Sorry, but I saw absolutely no reason for them to exist, other than to irritate Chewbacca. At this point, I have to stop, because I promised myself (and any readers) that this would be as spoiler-free a review as I could muster. 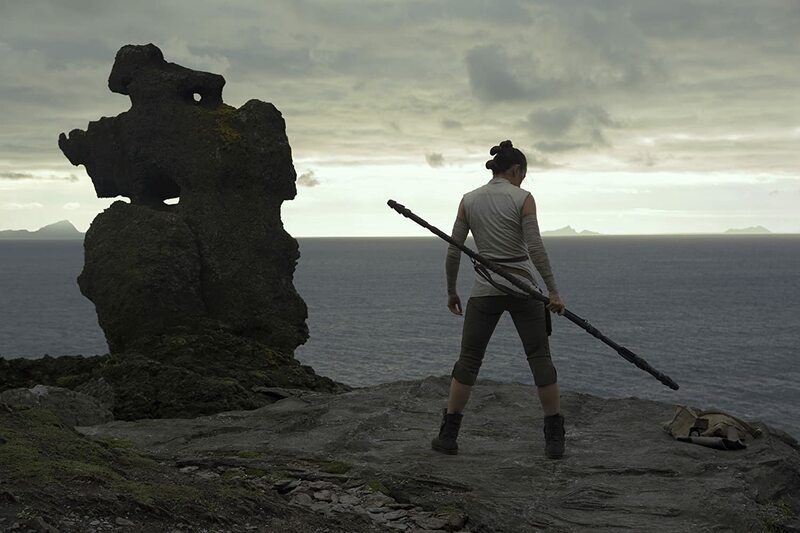 I enjoyed certain scenes and moments of “The Last Jedi” very much, but the sum of its parts did not equal a solid, cohesive whole. “The Last Jedi” is a good movie; but far, far away from a great one. I look forward to a review with spoilers. You have piqued my curiosity. Great write. I appreciate the lack of spoilers. I was curious what you thought, but I probably won’t be seeing it for a few weeks yet. the things that *didn’t* happen. And that we didn’t get answers to. I think Kylo Ren LIED to Rey, about what he told her, about her parents. Might there be a “real” truth that we find out in episode 9? Interesting. I usually agree with your reviews, so at least I won’t see this with unrealistically high expectations. But maybe it consoles me a little that I’ll have to wait until January to see it. I appreciated and took note of all the strong female characters. It’s a very rare thing. I enjoyed it. It’s a far from perfect movie, but I think the story moved forward in this one. I thought it was fitting that Luke was about as curmudgeonly in this one as Obi-Wan was in the original. I also appreciated the fact that this one was a truly original story, unlike TFA, which was more or less the same story as the original movie. I like the idea of a female-centric Star Wars movie, but this movie didn’t grab me. Rey seemed like she became very powerful with practically no training, and it all seemed kinda too easy. I felt myself more connected to Rose. I thought we were being set up to reveal that Rey was Ben Solo’s sister, but I hope he was actually telling the truth about her parents. Having the Force be democratized — rather than the property of one or two bloodlines — seems like a worthy message.